In the Vietnamese kitchen, banana leaf perfumes silky sausages and headcheese and many dumplings. But we seldom wrap large whole fish in banana leaf and grill it like our Southeast Asian brothers and sisters tend to do. Fresh lotus leaves, which are huge and easy to wrap with, is more typically used. Or, you use mud to encase the whole fish, usually freshwater snakehead fish (ca loc in Vietnamese). Or, you just grill the fish in a wire frame basket. But who has fresh lotus leaves and mud at their disposal? Or the right size wire basket? Not me. The other night, I thought of a wonderful lunch of grilled whole fish that I enjoyed with Robyn Eckhardt and David Hagerman in Kuala Lumpur in 2008. It was served with a briny-spicy-sweet dipping sauce made of funky shrimp paste, sweet kecap manis soy sauce, and chiles. 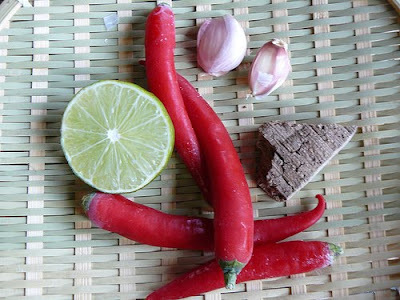 A terrific harmony of Malaysian ingredients. Wanting to recapture those flavors, I found a similar recipe in Christopher Tan’s Singaporean cookbook, Shiok! Chris is among the leading experts on Southeast Asian foodways and I trust him immensely. 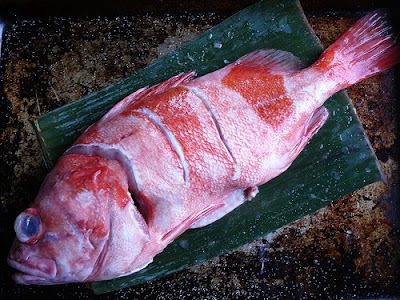 His ikan panggang recipe was modestly called “Barbecued Fish” in English. The flavors were fabulously big. I’ve adapted Chris’s recipe here for you. * Kecap manis (sweet soy sauce) in the pantry. All three of these ingredients are sold at an Asian market. If you don’t have the shrimp paste or kecap manis, then make a basic Vietnamese nuoc cham dipping sauce. 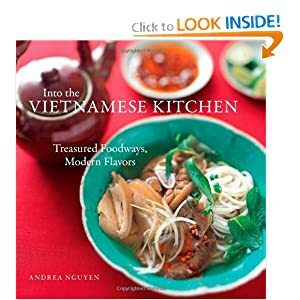 The ginger tamarind dipping sauce recipe in the “Basics” chapter of Into the Vietnamese Kitchen is extra good. And, if you’re new to banana leaves, review “Banana Leaf Basics” posted on my other site, Asian Dumpling Tips. 1. Break up the shrimp paste into smaller pieces, roughly the size of a pinky fingernail. Put it into a mini chopper with the chiles and garlic. Grind to a coarse texture. Add the soy sauce and lime juice. Process again until well blended. Transfer to a small bowl, taste, and if needed, add extra soy sauce and lime juice to downplay the spunkiness of the shrimp paste. Set at the table. Note that these chiles are "Holland" variety. you shoud keep them in the freezer. The pre-toasted belancan/blanchan is the taupe-colored dryish looking stuff. 2. Preheat a gas grill or ready a grill to cook at medium-high heat. Meanwhile, wash the fish and pat it dry. Use scissors to remove any hard looking fins that may poke you later at the table. Forget that the fish may look like Nemo's relative. Make two deep, diagonal slashes across the thickest part of the fish. Do this on both sides of the fish. Sprinkle with salt, including the belly of the fish. Rub a little fish sauce all of the fish, then rub oil on the fish. Set the fish on one piece of banana leaf. 3. When the grill is hot, put the banana leaf and fish on the grill. How much time it takes to cook the fish depends on the thickness of the fish. My general rule for grilling fish: 10 to 12 minutes for each inch. If your fish is 2 inches thick at its fattest place, cook for each side for 10 to 12 minutes, a total of 20 to 24 minutes. 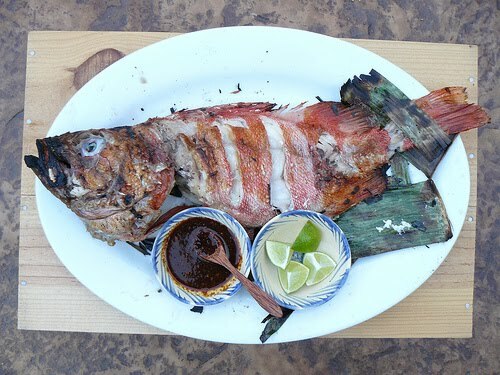 To flip the fish over and remove it from the grill easily later, put the remaining piece of banana leaf atop the fish. Then use two wide spatulas (hold them like you’re tossing a salad) to flip the fish over. Cook for the remainder period of time. To test for doneness, take a knife and poke at the flesh near the bone. If it flakes easily, the fish is cooked. 4. Transfer to a platter and serve immediate with lime wedges and the dipping sauce. Enjoy with rice and stir-fried vegetable. Or, wrap pieces of fish in lettuce leaf and dunk in the sauce.